Crowds of Bogotanos, lacking alternative transit options, wait to board the Transmilenio buses. Other commuters, attempting to drive, are stuck in severe traffic congestion. Photo by Carlos Pardo. 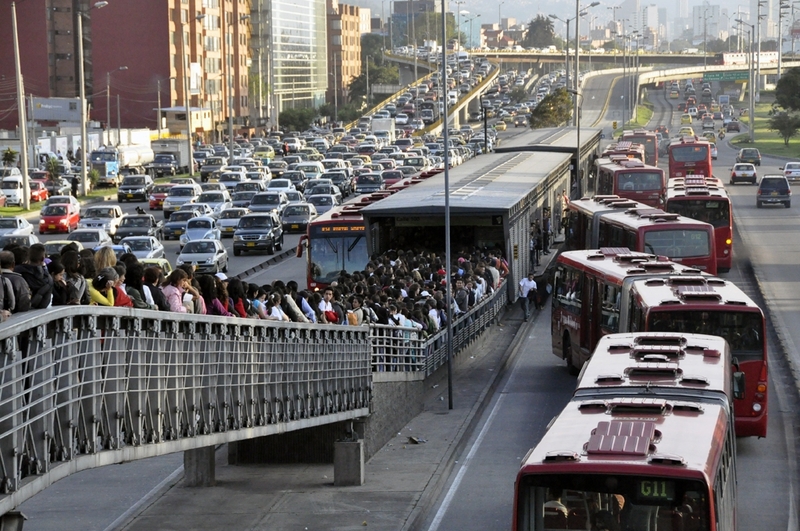 Traditional bus operators are apprehensive about the municipality’s proposed Integrated Public Transport System, which would continue to implement the Transmilenio project, integrate Transmilenio and private bus fares using an electronic fare card, substantially reduce the city’s vehicle fleet, and take aging, polluting buses that are more than 20 years old off the road in early 2012. Specifically, operators are unhappy with the amount of money the city is offering them to exchange their old buses for newer models. Apetrans believes that the government is charging unaffordable prices for the obligatory purchase of the new buses. Meanwhile – and somewhat ironically – Transmilenio has been picking up the slack for Bogotá’s many residents who depend on public transportation for their daily commute. During the strikes, Transmilenio has registered a record ridership of 2.6 million passengers a day, 1 million more passengers than normal. As Bogotá’s bus operators and policy makers sort all of this out, residents’ lives are turned upside down across the city and the country. The transit strikes have now spread to other cities. Meanwhile, little progress is being made in Bogotá. Negotiations have stalled after Mayor Samuel Moreno refused to grant the transportation association’s request that the city set pricing guidelines guaranteeing that bus owners who exchange their buses will make a monthly profit equal to 1.8 percent of their vehicle’s value. The bus strike is also taking a severe toll on Bogotá’s economy. According to the Colombian Chamber of Commerce, it has reduced retail sales in the city by 66 percent. It is estimated that up to 50.4 percent of the cities workers are being affected. The strike has also generated unrest in several communities stemming from frustrations resulting from transit shortages. The city has responded by closing schools, allowing buses from outside Bogotá to operate in the city, deploying the military to safeguard Transmilenio routes and suspending “pico y placa,” the system that restricts the days that car owners may use their vehicles.